I had a FULL-ON WEEKEND. I actually love those weekends because I hate those weekends where I do absolutely nothing as I feel like I've accomplished nothing. Saturday morning Tom and I went to Crows Nest so he could visit a music store which had a "pedal board" he wanted to buy (a pedal board in a suitcase thing which holds guitar pedals). 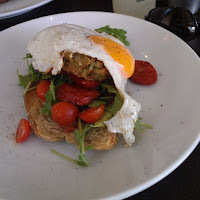 We had breakfast at Montagu which was ah-mah-zing. Seriously, we just stumbled across it and I am now ranting and raving about it to anyone who will listen. The produce was just so fresh and tasty. The only negative was the number of flies because they have an open kitchen. But it was worth eating breakfast with flies because the food was so good. 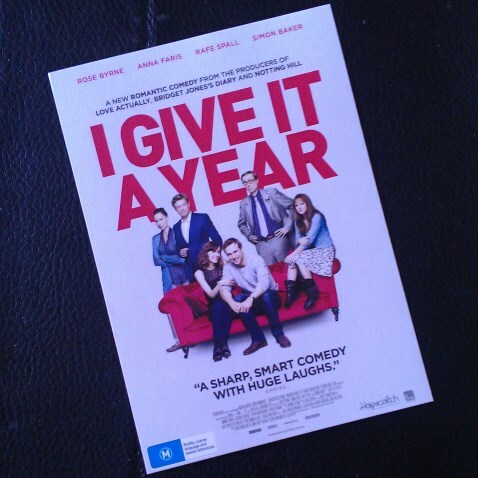 I got free tickets to see 'I Give It A Year' starring Simon Baker, Rose Byrne, Minnie Driver and Anna Faris. It was ok.... mindless fodder. Stephen Merchant's character is just outrageous. He was on the Graham Norton Show and said the Director wrote the role specifically for him and you can see why. It's also nice to see 2 Aussies playing major roles in a big Hollywood movie (although very sad that one donned a British accent and the other donned an American accent). We went to have dinner with Tom's parents and grandparents - his Grandma is a hoot, absolutely crackup. I always enjoy chatting to her. 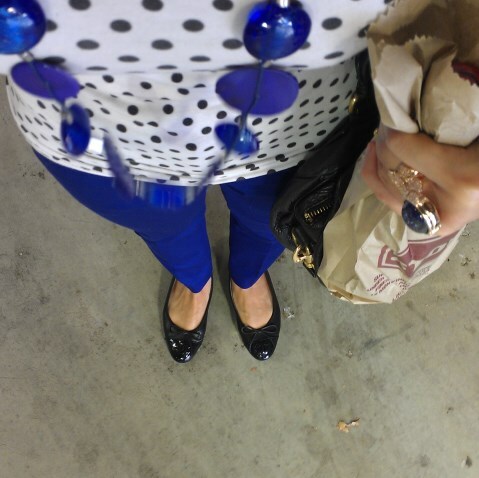 I wore my blue Marcs pants out for the first time and absolutely loved it. Sunday is always my day for visiting my family. Had lunch with Aunts and Uncles, played games with my cousins (of the board variety) between lunch and dinner, then dinner with my immediate family. I had a few ebay listings end tonight - only sold 3 things. Might just give the rest to Vinnies - can't be bothered relisting (apart from the expensive stuff). Busy weekends are always a good thing! I feel I've wasted my weekend if I have sat around and done nothing ha! Oh I am the opposite. 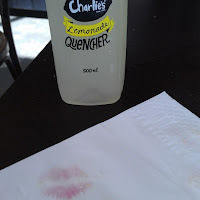 I had a nothing weekend last weekend and LOVED it. I hate it when my weekend is too busy and I don't get any couch time. Teehee. I think everything in moderation though. When I've had crazy hectic weeks at work, on occasion I do like to veg out on the couch. But more than one weekend in a row like that and I start going stir crazy! Charlie's Lemonade was super delish!! I'm super close with my family, actually been over 3 times this week already and will be over both weekend days. mmmmmmmmm That looks so good! I also think that it is very cute that you set aside a day for your family! I'm sure they enjoy every moment!